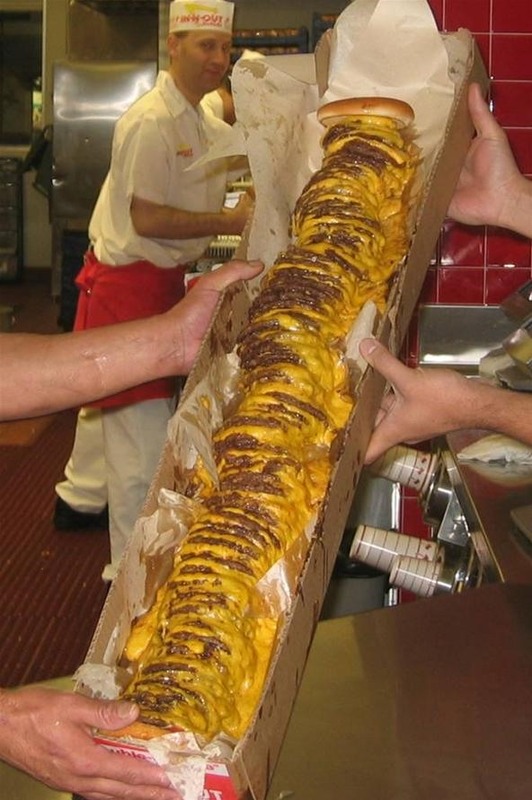 If you're familiar with In-N-Out speak, then you already know you can order several different ratios of meat to cheese—for example, 3 patties x 3 slices of cheese or 2 patties x 4 slices of cheese. But did you know you can order it "cold"? Yep. Anytime you add the word "cold" to your burger order, you will get just that—unmelted cheese. 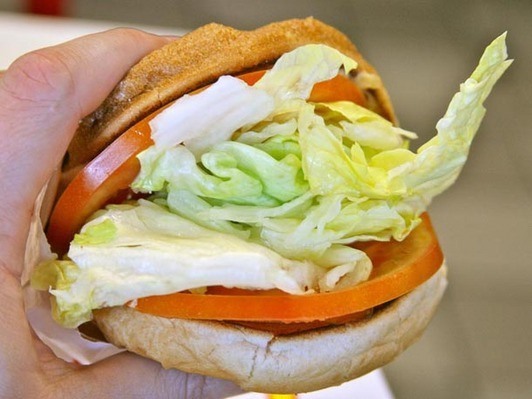 Utter the secret option "wish burger" or just plain old "veggie burger", and you'll get a pretty sad sandwich: a salad of hand-leafed lettuce, sliced tomatoes, onions, and pickles stuffed between two soft, toasted buns. 3. The "100 x 100"
This one isn't from Serious Eats, but it's so spectacular, I had to include it. A dude over at blog What Up Willy actually ordered a 100 x 100 and split it with 7 of his pals. 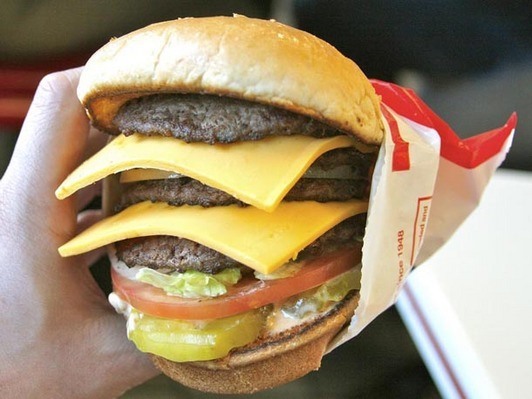 Would love to know how much one of these costs—truly amazing In-N-Out was willing to make it. 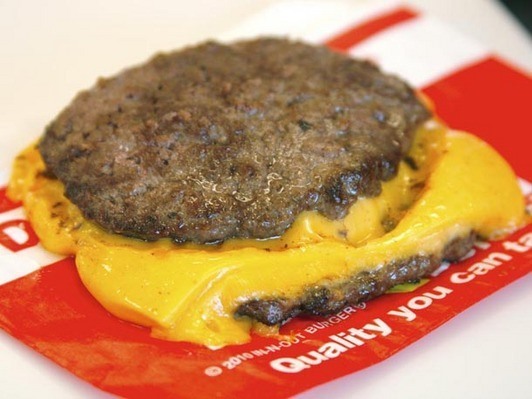 If you're on the Atkins track, try the "Flying Dutchman", a "sandwich" that skips the carbs and veggies and goes straight for the meat and grease—oil drenched patties in a puddle of melted cheese. Look messy? Try adding "Animal Style" (extra spread and grilled, chopped onions). You'll need a bib and a trough. 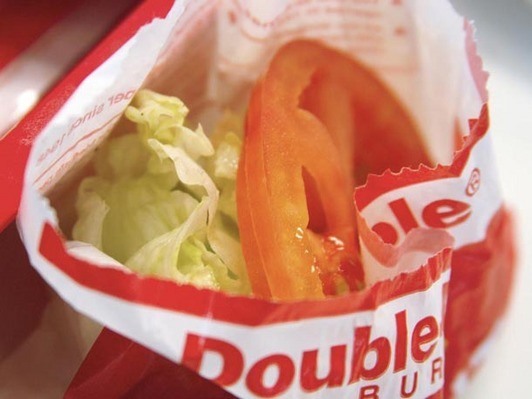 Perhaps the oddest and most tight-lipped item on the super secret menu, the "side salad" is simply a salad on the side: a few dinky pieces of lettuce, tomato and onions tucked into a Double-double wrapper. Weird. 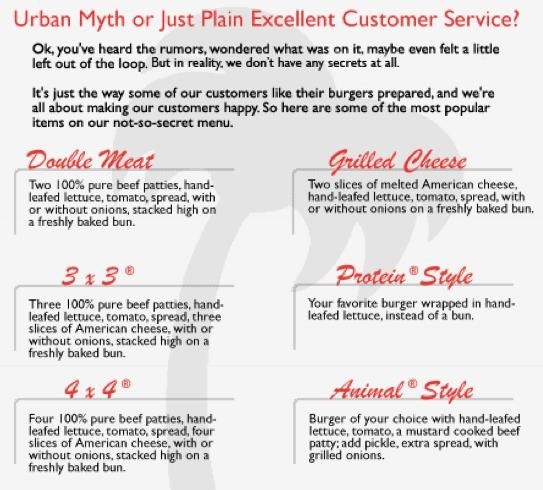 ok, the side salad's just pointless. but i really like the idea of ordering the fries "extra crispy" which would have them frying their fries twice. I like that too... though I thought the phrase was "fries well done"
Im from a state that doesnt have In-n-Out, now Im sad. I didnt realize they had secret items like this.